Raspbian is a Debian-based Linux distribution for Raspberry Pi. Like Debian, every 2 to 3 years Raspbian freezes the release status of all packages (programs, libraries, drivers, etc.) provided in the repository (software archive), Changes then only take place on a small scale. For example, with bug fixes or security updates. In parallel, Raspberry Pi Foundation continues to release improvements to Raspberry Pi-specific software. The previous Raspbian releases are Wheezy and Jessie. If a new Raspbian release is released now, then the previous release will be outdated with the provided software. In order to enjoy the new software versions, you have to perform a release change. This is an upgrade process that can take several hours, depending on the system. Why should a release upgrade be made? If you want to continue to enjoy new and up-to-date software after the launch of a new release, then you have to switch to the new release. This release change is similar when Microsoft releases a new version of Windows. Here you have the opportunity to upgrade to the new version. You can do the same with a release change from Debian or Raspbian. Why not do a release upgrade? Basically, you should consider a release change very well. As a rule, a change of release always causes one or the other to stop working. You will inevitably be confronted with extensive changes that will cause some functions to be used differently and not as usual. Sometimes the changes are so extensive that you can only ensure the provision of functionality after a certain training and testing phase. However, one or the other user of a Raspberry Pi would like to have a current system. But that is no reason to do a release change. With a screen workstation that may still be useful. Finally, you want to benefit from innovations and get any security holes closed quickly. But does that also apply to a system configured and tested with a lot of effort? A Raspberry Pi set up for special tasks and running in the background is not a candidate for a release upgrade. A release upgrade always makes changes to configuration files or overwrites them. The resulting changes may be so extensive that you have to expect a reconfiguration afterward. Provided the new software versions work as desired. Over time, you will be forced to think about a release change. Especially when a new release is due. In general, the better way to rebuild a server with a new operating system version is to migrate it. A new installation and reconfiguration is therefore to be preferred because troubleshooting a release change is not negligible and can be annoying. In addition, a new installation is an excellent opportunity to cut old braids and eliminate past pollution. What now? Release change: yes or no? The following recommendation can be used as a guideline, without any guarantee: If the initial setup and configuration did not deviate too much from the standard, a change of release will usually be good. Subsequently, the effort with respect to the changes to the existing configuration is limited. The more individual the system, the more complex the corrections after the release change. This means that you should then refrain from the release change and should consider a reinstallation. Note: A release change means a large version jump for some packages / programs / libraries. A big version jump can be problematic. Some things are backward compatible and continue to work. Other programs, however, no longer work or no longer work as usual. 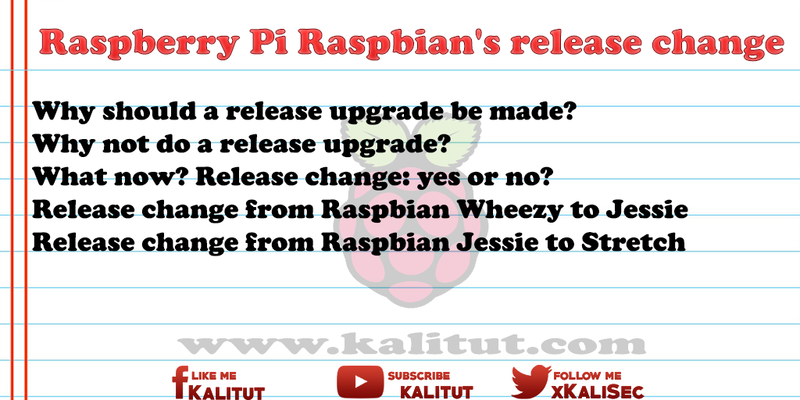 This is about how to update Raspbian "Wheezy" to the release "Jessie". This is about how to update Raspbian "Jessie" to the "Stretch" release. Which Raspbian release do I have? The information about the installed Linux distribution and the release can be found in the file "/ etc / os-release".